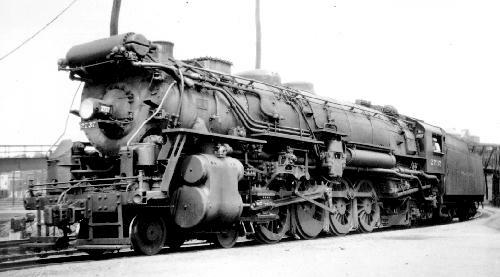 The New York Central Railroad needed a successor for its 4-6-2 "Pacific" that it was using for fast freight and selected the 4-8-2 wheel arrangement for a trail. In 1916, it bought a single "Mountain" type locomotive (road number 2500) from the American Locomotive Company and put it to the test. Satisfied with its performance, the NYC decided that the name "Mountain" would not be appropriate for a river level railroad and chose to call the 4-8-2 wheel arrangement "Mohawk" on its railroad. Twenty-nine more "Mohawks" were delivered by the end of the year. These thirty, ALCO built, locomotives (road numbers 2500 through 2529) were designated Class L-1a and had 28 x 28 cylinders, 69" drivers, a 200 psi boiler pressure and exerted 54,084 lbs of tractive effort. During 1917 and 1918, 55 "Mohawks" designated Class L-1b (road numbers 2530 through 2584) came from ALCO and in 1918, one hundred 4-8-2s would arrive from the Lima Locomotive Works. These Lima built locomotives, Class L-1c (road numbers 2585 through 2639) and Class L-1d (road numbers 2640 through 2684) were duplicates of the ALCO built Class L-1a locomotives. Between 1925 and 1930, the NYC bought a total of three hundred more "Mohawks" and designated them Class L-2. All 300 of the L-2 Mohawks were eventually numbered 2700 through 2999. Those L-2 Mohawks originally numbered 2450 through 2499 were renumbered 2950 through 2999 in 1936. 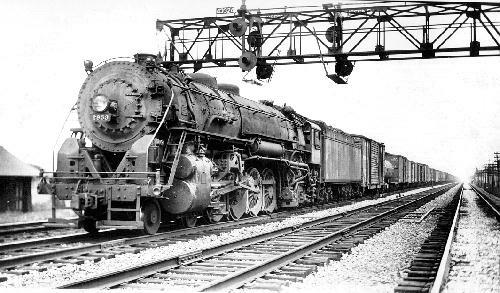 In the 1940s, 115 more "Mohawks" were added to the roster making a total of 600 4-8-2s built for the New York Central. This last group included the 65 Class L-3 (road numbers 3000 through 3034 and 3050 through 3064 from ALCO and road numbers 3035 through 3049 from Lima) and the 50 Class L-4 (road numbers 3100 through 3149 from Lima). The NYC performed heavy repairs on and did rebuilding of locomotives at shop complexes such as those at Beech Grove, IN and Collinwood, OH. The L-3 and L-4 Mohawks were built without smoke deflectors, and were the only Mohawks retrofitted with them. The L-3a Mohawks were built with roller bearings on all axles, but the L-3b and L-3c Mohawks were built with roller bearings on all axles except those of the driving wheels. The L-4 Mohawks were built with roller bearings on all axles. The L-3 Mohawks were built with Boxpok driving wheels and the L-4 Mohawks were built with either Boxpok or Scullin Disc driving wheels. These wheels had a nickel content of 2-3 percent, but no NYC engine was equipped with stainless steel drivers. According to Mr. Gerbracht, stainless steel has metallurgical properties which make it unsuitable for use in driving wheel centers or tires. There are two surviving NYC "Mohawks": number 2933 at the Museum of Transportation in St. Louis, MO and number 3001 at the National NYC Railroad Museum in Elkhart, IN. Within a couple of years of the time that 2568 was fitted with a new boiler at the same time it received a third cylinder (Locobase 16001), two of the L-1as described in Locobase 4793 emerged with a variant of that vessel. ; 2605 was converted in February 1923, 2518 in April 1925. The combustion chamber had indeed been replaced by longer boiler tubes, but the basic Type A superheater layout remained the same. Data from "New York Central 4-8-2 Type Locomotives," Railway Age Gazette, Volume 63, No 24 (28 December 1917), pp. 1167-1170 . (Thanks to Jason Cippola, whose 21 March 2015 triggered a complete overhaul of the New York Central's Mohawk entries and the creation of several new ones. His 13 March 2016 email linked the L-1 to the earlier K-11 Pacific. Thanks also to Chris Hohl for his 28 March 2019 email noting the increases in engine weights and tender capacities and weights.) Works numbers were 56000, 56027-56055 in 1916, 56910-56964 in 1917-1918 and Lima works numbers were 5499-5553, 5585-5629 in 1918. The first of a numerous stud of Mountains (known as Mohawks on the NYC). Schenectady built the first two batches 2501-2584), the first thirty designated L-1a, the other 53 L-1b. Lima continued with 2585-2639 (L-1c) and finished off the class with 45 (2640-2684) L-1d in 1918. According to Jason Cippola, the L-1's design was "basically an elongated version of the successful K-11 [Pacific]. The designers stuck with what they knew worked." (See the K-11 entries at Locobase 5578, 13884-13885.) He notes the squared dimensions of the K-11--26" x 26"--and notes the 28" x 28" of the Mohawks. The RAG report said the engines handled fast freights of 2,500-3,500 tons (75-93 loaded cars) over a 139 mile (224 km) route in five to eight hours of total time. But these were not the engines that made the 4-8-2 such a staple on the Water Level Route. For one thing, they were completed without automatic stokers. This meant, according to the New York Central Museum website (nycmuseum.railfan.net/MOHAWK.htm), that they couldn't use all the potential in their boilers. Moreover, they were hard on the track. Although the proportions of boiler to cylinder and to grate were approximately the same and L-1s had the same 14" (356 mm) piston valves, later Mohawks had bigger grates and boilers as well as a longer stroke and higher boiler pressure. Still, this class was big enough to merit upgrades of their own and by 1930, all had been retrofitted with Duplex stokers, almost all had trailing truck boosters, and 117 had feed water heaters. Elescos were installed on 20 L-1a, 18 L-1b, 24 L-1c, and 20 L-1d. Coffins were fitted to 1 L-1a, 14 L-1b, 7 L-1c, and 8 L-1d. 2533, 2610-2612, 2668 received Worthingtons. 2533 was equipped with thermic syphons. Original adhesion weight was 234,000 lb (110,223 kg) and engine weight 343,000 lb (157,850 kg). In his email, Chris Hohl noted weight increased, especially in those with feed water heaters and boosters. Tender water capacity almost doubled from the original 8,000 US gallons (30,280 litres) and it carried an additional 4 tons (3.6 metric tons) of coal. The original 72,000 lb (32,659 kg) empty and 166,700 lb (75,296 kg) loaded mushroomed to the figures in the specs. 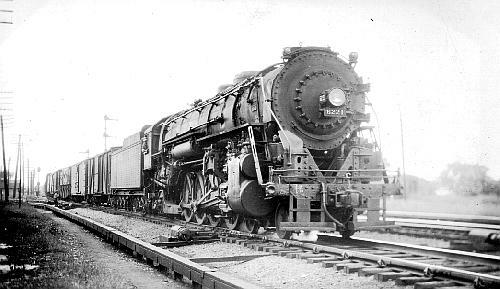 Two L-1b--2568-2569--were converted to a three-cylinder design (25" x 28") in 1922 and 1924, respectively; see Locobases 16000 and 16001. By the mid-1930s, 50 of the 185 L-1s (almost all those that had not been upgraded with feed water heaters) had been scrapped. By the end of World War Two, most surviving L-1s trailed tenders carrying 22-23 tons of coal. Locobase 4793 shows the original 1916-1918 L-1a design. 2569 was one of two converted by Alco to three-cylinder operation as part of that company's push to generate more power with lower forces in a given locomotive setup. Each of the three cylinders had an 11" (279 mm) piston valve. 2568, detailed in Locobase 16001, also had the new boiler that would be installed in all the L-1s. 2569 was retired on 1 January 1936 and were broken up in July 1936. 2568 was retired on 1 January 1936 and were broken up in April 1936. Data from the 1930 guide to Dimensions and Classifications of Locomotives seen on  (May 2003). (Thanks to Jason Cippola, whose 21 March 2015 triggered a complete overhaul of the New York Central's Mohawk entries and the creation of several new ones.) Works numbers for the L-2a were 66281 in March 1925, 66578-66647 in March 1926, 66648-66676 in May. Boiler had Elesco feedwater heater, valve motion with limited cutoff of 14" (356 mm) piston valves. Like the L-1s, these Mohawks were limited to a 60-mph (97 kph) maximum speed and they too had only flues with no smaller diameter tubes. But their bigger boiler and grate set the standard for later NYC 4-8-2s. The L-2c (Locobase 15994) were similar, but fitted with Coffin feed water heaters. Data from tables in 1930 Locomotive Cyclopedia. (Thanks to Jason Cippola, whose 21 March 2015 triggered a complete overhaul of the New York Central's Mohawk entries and the creation of several new ones.) Works numbers were 67742-67757 in February 1929, 67758-67766 in March, 68118-68142 in October. Known as Mohawks in New York Central service (Locobase 15900), these Mountains followed the NYC's L-2a and duplicated their dimensions. Boiler had Elesco feed water heaters in 2900-2914 and Worthingtons in 2915-2924, valve motion with limited cutoff operating 14" (356 mm) piston valves. Slightly larger boilers than the earlier L-2as. The Coffin would be replaced and the boiler reconfigured; see Locobase . Data from tables in 1930 Locomotive Cyclopedia. (Thanks to Jason Cippola, whose 21 March 2015 triggered a complete overhaul of the New York Central's Mohawk entries and the creation of several new ones.) Works numbers were 68118-68142 in October 1929, 68093-68103 in February 1930, 68104-68117 in March. Boiler had Elesco feed water heaters and BK stokers, valve motion with limited cutoff of 14" (356 mm) piston valves. Slightly larger boilers than the earlier L-2as (Locobase 444). More important, tenders trailing the last 50 engines used water scoops to extend their water range. The class's cast-steel engine beds, roller bearings, lightweight main and side rods meant the NYC could raise the maximum speed to 80 mph, thus making them truly dual-purpose locomotives. According to nycmuseum.railfan.net/MOHAWK.htm, L-3s developed 4,100 hp at 57 mph, which was a 23 1/2% increase over the L-2ds. Known as Mohawks in NYC service, 50 of this class went to the Big Four (CCC&StL); see Locobase 213. These two engines were upgraded after several years as high-speed-service locomotives. Timken roller bearings reduced friction on engine truck and all tender axles.5998 also received roller bearings on her driving axles. Cylinder diameter dropped by 1 1/2" (38 mm), but boiler pressure increased by 25 psi (1.72 bar). A trailing-truck booster added 13,750 lb (61.16 kN) to starting tractive effort. Data from tables in 1947 Locomotive Cyclopedia and NYC 1-1944 Locomotive Diagrams supplied in August 2013 by Allen Stanley from his extensive Rail Data Exchange. (Thanks to Jason Cippola, whose 21 March 2015 triggered a complete overhaul of the New York Central's Mohawk entries and the creation of several new ones.) Schenectady works numbers were 69337-69361 (L-3a) in 1940 and 69362-69371 in 1940-1941 (L-3b). Lima supplied another 15 in the same years as works numbers 7779-7793. Schenectady finished the class with works numbers 69745-69759 in 1942. The first 25 of these dual-service engines were assigned to passenger trains. All of the L-3s were fitted with roller bearings in both the lead bogie and trailing truck as well as the tender's six axles for lower resistance and faster running; only the driver still used plain bearings. Pressing the boiler at 250 psi meant smaller cylinders to fill and still greater power. Valve motion set with limited cutoff of 14" (356 mm) piston valves. The L-3b and c were fitted with trailing-truck boosters that added 14,000 lb (6,350 kg) to starting tractive effort. L-3a and L-3c had Worthington feed water heaters. L-3b mixed in Worthingtons (3025-3034) in the Schenectadies and Elescos in the Limas (3035-3049). Drury (1993) claims they were the equal of the better-known Hudsons at passenger running while the 4-6-4s couldn't haul freight. The L-4s that followed the L-3 class (Locobase 215) had drivers that were 3" taller. The nycmuseum.railfan.net/MOHAWK.htm website puts it more strongly about both the L-3s and L-4: "[Their] performance was almost beyond belief. It was nothing for them to bring in a heavy freight drag, be serviced, and leave a few hours later at the head of one of the "Great Steel Fleet' passenger trains.". In the latter service, their huge twelve-wheel tenders ensured endurance. Although tank capacity seemed almost modest, track pans between the rails on the Water Level Route meant the engine could take on water while scarcely slowing down. 86,000 lb (39,009 kg) of coal cut the number of stops for refuelling considerably. Data from tables in 1947 Locomotive Cyclopedia and NYC 1 - 1946 Locomotive Diagrams supplied in May 2005 by Allen Stanley from his extensive Rail Data Exchange. (Thanks to Jason Cippola, whose 21 March 2015 triggered a complete overhaul of the New York Central's Mohawk entries and the creation of several new ones.) Works numbers were 7978-7988 in December 1942, 7989-7994 in January 1943, 7995-7999 in February, 8000-8002 in March, 8292-8298 in October, 8299-8307 in November, 8308-8316 in December. Farrington (1976), who didn't particularly like the J-class Hudsons, says these L-4s could climb Albany Hill with seven cars in tow without a helper. The nycmuseum.railfan.net/MOHAWK.htm website puts it more strongly about both the L-3s and L-4: "[Their] performance was almost beyond belief. It was nothing for them to bring in a heavy freight drag, be serviced, and leave a few hours later at the head of one of the "Great Steel Fleet' passenger trains." 50 L-4s ran up about 5.5 million miles (8.55 million km) in their first four years--an average of 27,500 miles (44,275 km) per locomotive per year. 4.5 million (7.25 million km) of that distance was covered hauling passenger trains.